The State University of New York Board of Trustees today announced the appointment of Dr. Roger A. Ramsammy as the seventh president of Hudson Valley Community College. Ramsammy comes to Hudson Valley with more than 30 years of higher education experience, including academic and administrative leadership positions at three of the largest multi-campus colleges in the United States. He is the former president of the West Campus of Miami Dade College and previously served as provost and chief academic officer at Northern Virginia Community College. Prior to that, at Palm Beach State College, he was professor of Microbiology and Anatomy and Physiology, chair of Biology, associate dean of STEM and dean of Academic Affairs. Ramsammy has earned numerous awards for leadership, effective and inventive teaching, online instruction and academic program development, including the Virginia Governor's Award for the most innovative STEM program; the Florida Association of Community Colleges and Palm Beach State College "Professor of the Year" awards; and the Adjunct Professor of the Year award at Broward College. Ramsammy is an American Association of Community Colleges past Commissioner for Diversity, Inclusion and Equity and recently served as the organization's Commissioner for Academic, Student and Community Development. He also was awarded the Martin Luther King Jr. Cultural Foundation Outstanding Educator Award for his dedication to educational services for underserved populations. Ramsammy is a first-generation college student. Prior to a post-doctoral fellowship at Georgetown University's Lombardi Cancer Center, he earned a Ph.D. in Molecular Biology and a master's degree in Genetics from Howard University. He holds a bachelor's degree in Biology from the University of the District of Columbia. "It is a great honor to be selected as president of Hudson Valley Community College, an institution with a national reputation for academic excellence and exemplary service to its students and the greater community. I am excited to begin working with the college's faculty and staff, community and government stakeholders and SUNY leaders to advance this already exceptional institution," said Ramsammy. "I share my thanks with SUNY Chairman Carl McCall, Chancellor Kristina Johnson and the SUNY trustees for their trust and belief in my leadership abilities. I also am grateful to Hudson Valley's board members and search committee led by Neil Kelleher, President Drew Matonak and the college's students, employees, and community leaders who have demonstrated the overall quality and integrity of the college throughout the search process." Ramsammy and his wife, Annette, have three children, Khalid, Josie and Shayda. "My family and I look forward to moving to the Capital Region and becoming a part of the fabric of the community," he added. "We are impressed by the breadth of Dr. Ramsammy's diverse career, particularly his focus on innovative programs that help keep students in school, support them through to college completion and set them on a path to a rewarding career," said SUNY Board Chairman H. Carl McCall. "Dr. Ramsammy's leadership is certain to benefit the students, faculty and staff at Hudson Valley Community College as well as New York's Capital Region." "Throughout his career in higher education, Dr. Ramsammy has been a problem-solver and an academic change-agent at the local, state, national levels," said SUNY Chancellor Kristina M. Johnson. "Dr. Ramsammy is ideally suited to serve as the next president of Hudson Valley Community College, where I know he will create new opportunities for students, faculty and staff and build upon our partnerships with area businesses and the local community." 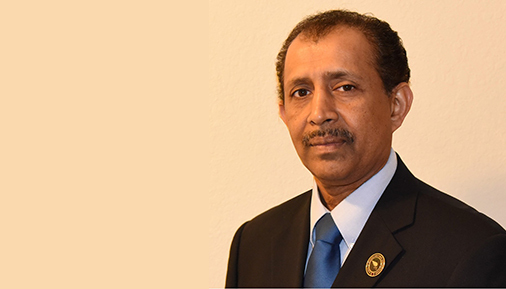 "Following a national search, we're proud to welcome Dr. Ramsammy to the college. I'm confident that we've selected a leader who has a strong vision, innovative ideas and a collaborative spirit to work productively with our community's many partners and our dedicated faculty and staff," said Neil Kelleher, chair of the Hudson Valley Community College Board of Trustees who also served as chair of the presidential search committee. "We had a very competitive search with a strong group of candidates to lead Hudson Valley into the future. I greatly appreciate their interest in joining our college, as well as those who took part in our presidential search process. In particular, I thank all members of our search committee for their time, talent and dedication. They have been incredibly productive, respectful and cohesive as they worked in the best interest of our college," Kelleher added. "My sincere congratulations to Dr. Ramsammy on his selection as Hudson Valley's next president. I look forward to working with him in the months ahead to ensure a smooth leadership transition, and ultimately, to nurture and advance the college for the benefit of our students and workforce and community development partners. Hudson Valley is well positioned for the future, and I'm confident that the college will continue to be one of our region's greatest assets under Dr. Ramsammy's leadership," said Drew Matonak, president of Hudson Valley. A leadership transition plan will be outlined during the spring semester. Matonak, the sixth president of Hudson Valley, began his tenure at the college in 2005. He informed students, faculty and staff in June 2016 of his plans to retire in August 2018 after 13 years of leadership at the college and a career in higher education spanning four decades. Kelleher praised Matonak following his announcement. "Drew has provided remarkable leadership for Hudson Valley through a period of incredible growth and dynamic change. We're extremely grateful for his years of dedication to the college and also for his commitment to partnership and service within the greater community." The presidential search process began in spring 2017 with the appointment of a 24-member presidential search committee and hiring of the executive search firm, Isaacson, Miller. Following meetings with members of the college community to set the direction for the search, the firm organized a national recruitment effort and presented candidates with a variety of backgrounds and experiences. Following interviews, finalists were selected. Ramsammy participated in meetings with members of the campus community and community stakeholders on Oct. 12 and 13 following interviews with presidential search committee comprised of faculty, staff, students, alumni, trustees, foundation board members and local leaders. Ramsammy was approved by the college's Board of Trustees on Oct. 25 and later by the SUNY Board of Trustees on Nov. 15. He follows former college presidents Dr. Andrew J. Matonak (2005-2018), Dr. Marco J. Silvestri (interim appointment from 2004-2005); John Buono (1998-2003); Dr. Stephen M. Curtis (1996-98); Dr. Joseph J. Bulmer (1979-1996); James J. Fitzgibbons (1965-1979); Otto V. Guenther (1953-1965). For more information about the presidential search, visit www.hvcc.edu/presidentialsearch. Founded in 1953, Hudson Valley Community College offers more than 85 degree and certificate programs in four schools: Business; Engineering and Industrial Technologies; Health Science; and Liberal Arts and Sciences; and an Educational Opportunity Center for academic and career training. One of 30 community colleges in the State University of New York system, it has an enrollment of nearly 11,500 students, and is known as a leader in distance learning initiatives and workforce training. Hudson Valley has more than 75,000 alumni.